The Chieftain 2200 screen is the first Powerscreen machine with a double deck screenbox. 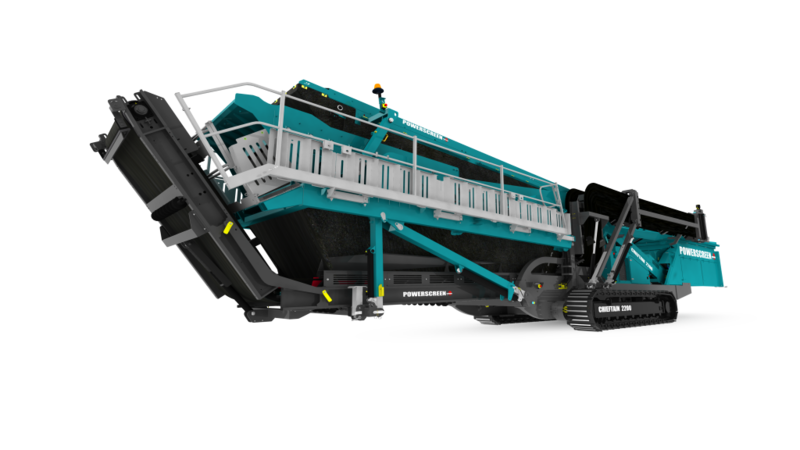 Chieftain 2200 - "A big step up from competitors"
The Powerscreen Chieftain 2200 is designed for operators who require large volumes of high specification products with maximum versatility, in aggregate, C&D recycling and a range of applications. It has a revolutionary patented drive system which allows switching between 2 and 4 bearing with bolt-on parts. The maximum variability of the Chieftain offers improved capabilities over its class rivals, especially when trying to make high specification aggregate. It's two highly versatile, double deck screenboxes provide a total screening area of 19.5m2. The Chieftain 2200 screen is the first Powerscreen machine with a double deck screenbox. With a massive benefit of a quick set-up time (typically under 30 minutes), hydraulically folding conveyors and track mobility, its high aggression screenboxes can handle dirty, sticky material with ease. Stop by booth 5004 at the National Heavy Equipment Show in Toronto and speak to Powerscreen of Canada, the crushing and screening experts. For more information on Powerscreen® crushing and screening products or Customer Support please contact your local distributor. Details can be found on the informative website www.powerscreen.com.